THE REGENT BOWERBIRD (Sericulus chrysocephalus) is not only incredibly beautiful and intelligent, but the species has given rise to one of the rarest birds in Australia – a hybrid of the regent and satin species, which has only ever been photographed twice. 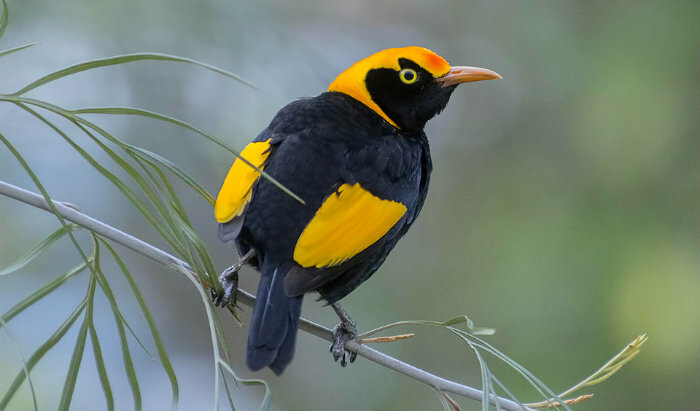 Endemic to Australia, the regent bowerbird is found throughout the rainforests and leafy coasts of eastern Australia, all the way up in central Queensland, and down into New South Wales. They display striking sexual dimorphism – the males, as seen above, are covered in silky black plumage, with glossy golden feathers on the ends of their wings, and pouring down over their heads like a thick, molten crown. The females, of course, are a dull, speckledy olive colour. During the breeding season, a male will spend approximately three percent of his day constructing and maintaining his bower, built from an array of sticks maneuvered into a short, roofless corridor shape. This is obviously a very small portion of his day, and much less significant than the time other bowerbird species spend on theirs, most likely because the regent bowerbird male likes to begin his courtship routine up in the canopy. Read on via Regent bowerbird, an intelligent builder – Australian Geographic. ← The Strange Death of Edgar Allan Poe,1849. I have been referred to as a bowerbird – not because of my looks, though!